Taha Ahmed Khan, the youngest son of Mrs. Rudaba Irshad and Mr. Irshad Ahmed Khan (Late) was born in Karachi. He started his early education from St. Peter High School and did his Matriculation in 2008.Got admitted in Government National College in Pre-Engineering Group and passed his Intermediate Science Examination in good grades. Finally he got admitted to NED University of Engineering and Technology Karachi. Taha completed his Bachelor of Engineering Degree in Chemical Engineering with Majors in Polymer and Petrochemical Engineering in 2014 in flying colors. 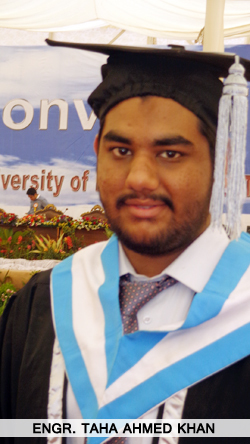 Taha Khan was the part of 23rd Convocation of NED University of Engineering & Technology held on March 25, 2015 in Karachi and the Degree of Bachelor of Chemical Engineering with Majors in Polymer and Petrochemical was conferment by the Vice Chancellor of the NEDUET. Engr. Taha A. Khan is the nephew of Engr. Iqbal Ahmed Khan, Vice President of Saudi Aramco Ex-Employees Association (SAEEA). Iqbal Khan is also an Alumni of NEDUET in Mechanical Engineering. Taha use to be very active in his class and was a part of the Department Cricket and Volleyball Team. During the course of his study in NEDUET, Taha Khan did a 4 weeks Internship in an automobile parts manufacturing Industry named as AviTronics Limited at Hub Karachi. Engr. Taha Ahmed Khan has two elder brothers, the eldest is Engr. Bilal Ahmed Khan graduated in Electronics Engineering from Sir Syed University of Engineering and Technology Karachi and is working with M/s ENAR Petrotech Services (Pvt) Ltd. and the one elder to Taha is Usama Ahmed Khan who completed his BBA from Institute of Business Management (IoBM) Karachi and is working with M/s Pakistan Petroleum Ltd. In Kandhkot Sindh. The elder only sister and Mother are teaching at Smart School-PECHS Branch Karachi. Engr. Taha Ahmed Khan has future plans to achieve a Masters Degree in Chemical Engineering from the United Kingdom and finally settle in the UK. SAEEA wish Engr. Taha Ahmed Khan a very bright, happy and prosperous future and hope that all his dreams are fulfilled.